A sophisticated satellite was launched intospace today to improve the preeminent path of communications between thepresident, military commanders and troops on the battlefield, ensuring asurvivable line of contact even in hellish scenarios of nuclear warfare. Three solid-fueled boosters mounted to thelauncher's kerosene-fed first stage provided a substantial kick in speed andpower coming off the pad, sending the 197-foot-tall, million-pound Atlasblazing a trail toward the east. A scant five minutes later, the rocket hadascended out of the atmosphere and the cryogenic Centaur upper stage lit itsliquid hydrogen and liquid oxygen engine for the first of two burns. The secondfiring delivered the necessary push to deploy the AEHF 1 satellite into ageosynchronous transfer orbit. The 13,420-pound payload separated from therocket 51 minutes after liftoff while cruising high above the Indian Ocean. "The team of folks behind the first AEHF mission is a greatset of Americans who have dedicated many years of their life to put thissatellite into orbit," said Col. Michael Sarchet, commander of theProtected Satellite Communications Group at the Space and Missile SystemsCenter. "AEHF is a very sophisticated satellitebecause it is built to provide the highest levels of protection for ournation's most critical users. Encryption, low probability of intercept anddetection, jammer resistance and the ability to penetrate the electro-magneticinterference caused by nuclear weapons are essential features whencommunication can be of the highest priority," said Sarchet. Controllers plan to spend the next 100 daysor so using the craft's conventional and exotic ion propulsion systems tocircularize the orbit 22,300 miles over the equator at 90 degrees Westlongitude for months-long testing. Built in a collaboration between LockheedMartin and Northrop Grumman, this and future AEHF spacecraft will replace theaging Milstarsatellite fleet to provide faster communications simultaneously to moreusers through modernized technology. "It really does mark a new era for us.Milstar was the first protected (communications satellite) system that we everput up and it's done a great job for us. We launched the first one back inFebruary 1994. If you add up all the on-orbit life of the five vehicles upthere operating, we've got over 56 years experience with Milstar," saidCol. William Harding, the Military Satellite Communications Systems Wing vicecommander at Los Angeles Air Force Base. "But it is getting older. All five ofthe spacecraft are past their 7-year mean mission duration and two of them are pasttheir 10-year design life. So it's time to move on to the next version --AEHF." Designers say one AEHF spacecraft hasmore capacity than Milstar's five-satellite constellation combined and itsfaster data rates will benefit tactical military communications, enablinghigher quality maps, targeting data and live video to be transmitted withoutbeing detected by the enemy. "AEHF also will provide a five-foldincrease in the numbers of communication coverage opportunities so that moreterminals spread over more of the globe will be able to access morecommunications resources," Harding said. The new satellites will be crosslinked withthe existing Milstars, and the AEHF are compatible with existing userequipment. "The benefits also include use of smallterminals that can provide high data rate channels, resilience againstelectronic warfare and cyber attack, and survivable, high availabilitycommunications connections across the full spectrum of military operations frompeacetime training to nuclear warfare," Sarchet said. AEHF was envisioned to keep communicationsflowing between the military and civilian leadership in any extreme wartimeenvironment, giving the U.S. information superiority. Communications relayed through AEHF caninclude critical support to Special Operations, situational awareness for Armytroops, giving last-minute targeting information to en-route Air Force fightersand transmitting Tomahawk missile updates to the Navy. For the nation's nuclear forces, thesehardened satellites would be the communications lifeline for crisis responseand war planning in the most dire circumstances imaginable. "Communications links for control of theU.S. nuclear force, force direction from the president of the United States,missile attack early warning, missile defense, communications support toSpecial Operations and high-speed anti-jam protected communications fortactical forces," said Sarchet. Milstar and its AEHF successor are fardifferent from the other types of communications satellites operated by themilitary. The Navy-led UHF system provides mobile communications to a largenumber of user terminals but at low data rates. The Defense Department'sbackbone network using DSCS and the newer Wideband Global SATCOM craft offersvery high data rates but lower mobility. Harding says when a critical piece ofinformation needs sent and it must get there, you call upon "theFedEx" of military communications with Milstar and AEHF. But developing state-of-the-art satelliteshasn't been cheap. The Air Force says the current scope of the AEHF contracttotals $6.462 billion. Constructed around Lockheed Martin's A2100satellite model with a 14-year design life, the AEHF satellites featurepower-generating solar panels stretching 89 feet tip-to-tip and twoantenna-laden deployable wings. "The satellite uses a mix of phasedarray and dish antennas to create over 194 coverage areas on the ground,"said Sarchet. The improved data rates on AEHF vary from 75bits per second to 8.2 million. 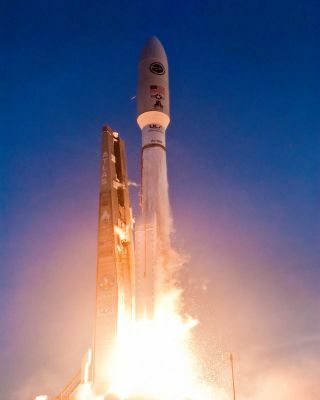 "Speaking for Lockheed Martin SpaceSystems, we have great confidence based on our proven Milstar experience, ourflight-proven A2100 spacecraft bus and our successful Advanced EHF integrationand test program that we have built a satellite that will meet our customer'sexpectations and set a new standard of excellence for the U.S. military,"said Mike Davis, the company's vice president for AEHF. "The collective team has workedextremely hard to prepare this important spacecraft for flight. We all lookforward to achieving mission success." Two more AEHF satellites are progressingthrough factory testing. AEHF 2 should be ready for shipment to the launch siteby the end of this year for liftoff aboard another Atlas 5 rocket in early 2011,and AEHF 3 could fly in early 2012, Davis said. Long-lead items for AEHF 4 have been ordered.However, the full satellite hasn't been placed under contract yet, Hardingsaid. At least four spacecraft are needed to cover the globe. The United Kingdom, Canada and theNetherlands are partners in the AEHF program, providing some funding inexchange for a corresponding amount of resources from the satellites.